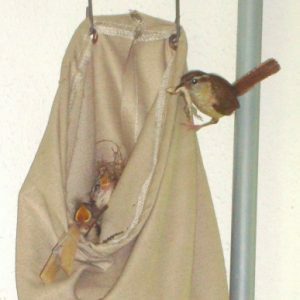 Have you noticed any nests in your neighborhood? No? Are you sure? You are here: Home / Events of Interest / Have you noticed any nests in your neighborhood? No? Are you sure? Go outside this spring and check out store signs, streetlights, balconies, traffic lights, gutters, downspouts, rooftops, stadium lights, light fixtures, grills, utility poles, potted plants and more! You’ll be amazed at what you’ll find, and be sure to share your discoveries with us! Cornell Lab of Ornithology are not looking for professional photographers. They are just looking for interesting stories with hopes that people of all ages will participate, they accept diverse types of entries like poems or videos, too. Youth are encouraged to submit entries (please let them know that it is a youth entry in the description). Prizes include a mini-iPad, binoculars, Pennington bird feeders, Inside Birding DVDs, Bird guides, Cornell Lab of Ornithology Membership Gift Packets, Project FeederWatch posters, and much more.